True but you also get infinite warfare. With this you need the infinite warfare disc in to play cod remastered. Thanks for mentioning that - was going to order only for Modern Warfare but if it needs the disc to play I'll leave it. Thanks for mentioning that - was going to order only for Modern Warfare …Thanks for mentioning that - was going to order only for Modern Warfare but if it needs the disc to play I'll leave it. Coming to Plus if you have it. What is going on this Day? This is my main gripe! 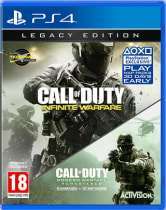 Bought it on release for £70 but have to have IW disk in which is constantly updating! So thats why this is reduced. Will get it on PSN+ next month instead then cheers. I agree - really enjoyed the campaign on this too but already have it - but if you dont then definitely worth picking up. I agree - really enjoyed the campaign on this too but already have it - …I agree - really enjoyed the campaign on this too but already have it - but if you dont then definitely worth picking up. I only bought the double pack for Remastered, but IW was a massive surprise after Advanced Warfare, which I thought was really average! OOS at that price. Was this new or pre-owned thread does not state? I bought it earlier and its stated as new. Only just seen this and unfortunately the price has gone up to £13. Great find though. Beware just had mine through and it certainly was not new and code redeemed.